Even though the electric vehicle market is a small one that’s growing, when a model has the ability to nearly double its range because the brand move to the next generation of the vehicle, we need to pay attention. The 2020 Kia Soul EV is a car that offer you a battery-powered model that will give you the drive you want and make it possible for you to avoid going to the gas pump to refuel. This new second generation of the Kia Soul offers you the longer drive that you want when it’s time to head out on the road. 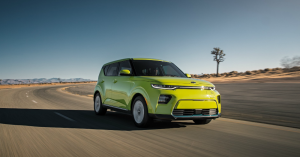 The 2020 version of the Kia Soul EV offers you a 356-volt AC motor that brings you 201 horsepower and 295 lb.-ft. of torque for the drive you’re looking for. This motor makes use of a new 64-kWh battery pack that will give you the drive you want for up to 243 miles of range on a single charge. This means you can make your drive several days in a row without recharging or you can enjoy the longer range and drive farther every day before you come home to recharge your batteries. Get inside the new Kia Soul EV and you’re going to find the textured trim you want to see on the door panels along with large gloss-black elements that make their way to the central dash and console. There’s also multi-color interior lighting that works with the Sound Mood Lighting system to pulse to the beat of the music that you play, which turns the Kia Soul into a virtual rolling nightclub. These features are great and offer you the benefits you want when you take this car out for a drive. Infotainment comes from the 10.25-inch touchscreen display that allows you to have up to three functions operating at the same time. This screen gives you the ability to connect using Apple CarPlay and Android Auto to make sure you can see the apps you normally enjoy when you make use of your phone. The instrument cluster comes to you on a TFT screen to give you the gauge readings for you to have the readings you want. This car is also offered with a head-up display to offer you the information you want right in front of your view. Get behind the wheel of the 2020 Kia Soul EV and let this car become the one that will offer you the drive you want when you’re looking for a way to avoid gas stations altogether. It’s time for you to have the drive you’re looking for when it’s time to head out on the road. Visit your nearby Kia dealership and see if this new electric vehicle is the right choice for your daily driving needs. Charge it up and head out on the road to enjoy the fun and funky style that begins this new second generation of the Kia Soul EV. Like what you see? Check out these Kia lease specials today!